One incredibly simple but effective thing you can do to improve your SEO rankings is to put keywords in your Alt tags. The Alt tag (also called Alt text) is a line of text which describes the image. It is what will show up if your image cannot render for some reason. Why wouldn’t your image render? It might be a browser problem. It could be that the user has images disabled. Or maybe the user is vision impaired and uses a screen reader. In any case, putting in Alt Tags ensures that the message you want to convey with the image gets across, regardless of whether the image is seen. 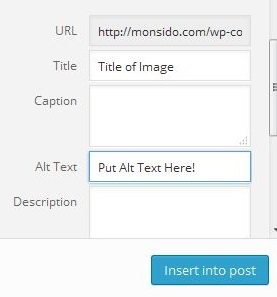 In WordPress you can put the Alt text in when adding photos. Why Are Alt Tags So Important for SEO? The last we checked, Google bots still don't have eyes and can’t see images. They rely on Alt tags to convey what the image is about. Alt tags aren’t a big on-page ranking factor but, as we’ve seen in competitive niches, every little bit can help. So don’t waste this opportunity to get more keywords onto your pages. Don’t be spammy about it though Just write Alt tags which would make sense if the image didn't render for some reason. Another important note about Alt tags for SEO is that many people use Google Image Search when browsing the web. Alt Tags are definitely important for Image Searches. If you are in a niche which is likely to get lots of image searches, such as fashion or entertainment, then optimizing Alt Tags can really boost your search traffic. Alt Tags are quick and easy to fill in when adding images to your web pages. The problem is that it is easy to forget this small step. So how do you know if you (or the intern you’ve delegated the job of posting to) have forgotten to put in Alt Tags? No, you don’t have to go through every single image on your website and check whether it has an Alt Tag. With the Monsido Webmaster and SEO Tool, you can get a list of all missing Alt Tags instantly. The Monsido tool scans your website and looks for errors and SEO opportunities (in addition to finding missing Alt Tags, it also finds opportunities like missing H1 Tags and Title Tags, and broken links). You can then see all the errors in the intuitive dashboard and get to work fixing them. The Monsido tool scans your website weekly, so you can always stay on top of your SEO.